Curt Walker stands proudly next to his telescope array, which is comprised of a Orion 80ED f/7.5 APO refractor, and homebuilt 70mm guide scope atop an Atlas EQ-G mount. It was in February of 2007 when our astronomical WebHub caught the attention of a newcomer to the area by the name of Curt Walker a GIS Analyst, freelance photographer, and budding amateur astronomer. Curt sent me an email at that time expressing a great desire to engage with amateurs and astronomical groups to further enhance his knowledge in the subject. In response, I provided Curt with a list of astronomical clubs and societies in the area. Though the VSC-2 is not a full fledged astronomical society in the least, I had the pleasure to meet Curt via an invitation to come over to my home for a chance to look through my just completed 10" f/5.6 Fork Mounted Newt. Curt had never look through a telescope of that aperture. Once he did, and from that point on, as Curt would say, "I created a monster". And what a monster indeed! Since that pleasurable observing session, this young man has accomplished tremendous feats in amateur astronomy among other accolades. In accomplishing this level in the area of astrophotography in such a limited amount of time, we here at the VSC commend his achievements by showcasing just a smidgen of his work. Please click on the "Curt's Photos" button above to see what we mean. Curt's skills continue to improve exponentially. Currently, he is working on a fantastic project. The construction of an 8" f/5 Newtonian Astrograph, which will be utilizing a R. F. Royce mirror set. Please click on the "Curt's 8" Astrograph" button to go to Curt's own website showcasing the ongoing construction process of this fine instrument. According to Curt, it is slated to be completed around the end of the year. 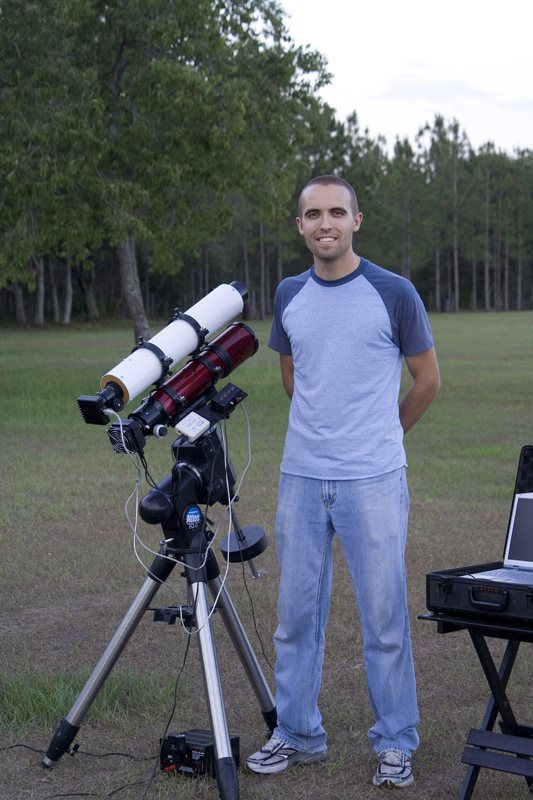 As a potent member of the FarrOut Observatory observers group (owned by Dennis Farr) in Dade City, FL, Curt has firmly established himself as a resource in DSO imaging. He always seeks more and more knowledge in the feel and shares it to help others. Please join us here at the Vega Sky Center in congratulating this young man, Mr. Curt Walker, in the achievements he has attained as an astrophotographer and ATM.